This article is about the song by The All-American Rejects. For the film, see Jodi Arias: Dirty Little Secret. "Dirty Little Secret" is a song by American rock band The All-American Rejects, released as the lead single from their second studio album Move Along on June 6, 2005. "Dirty Little Secret" was released to radio on June 7, 2005. 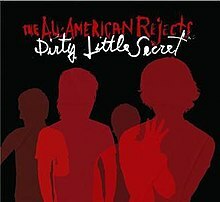 "Dirty Little Secret" was written by Nick Wheeler and Tyson Ritter, who claimed that because they were both at the time in long-term relationships with their girlfriends they had to "concoct some histrionics". Wheeler said "We come from a small town, and until now we've both had steady relationships. So, you know, sometimes there's not enough drama or turmoil to write about, so he simply writes stories. And that's where the lyrics come from." "'Dirty Little Secret' was just an acoustic guitar and a vocal, that's all it was," Wheeler went on to say, "We put off getting the full band in and coming up with the arrangement until the very last second. We were literally less than a week away from going into the studio, and we all started jamming and tossing out ideas. We had the arrangement down within an hour and that was that. We ended up recording it and couldn't get the motherfucking thing out of our heads." The song received generally positive reviews from music critics. Contactmusic.com stated "Give this cheeky little track three listens, and it's got you. You'll be singing along at festivals all summer with a huge grin on your face. There may indeed be laws in some countries about having hooks this large and frequent during one song", while About.com said "'Dirty Little Secret' is catchy and amiable, but it's little more than that. The title seems chosen for intrigue, but it promises much more than it delivers. The song is ultimately a rather ordinary treatise on carrying on a secret relationship." ClickMusic reviewed with "There's nothing exciting about this. It seems such a tired format, a group of guys in their early 20s peddling teenage angst like they were A. It's upbeat, rocky with a typically catchy, if corny, chorus, yet this really seems like one for the fan base only." Music OMH stated "If Simple Plan are a poor man's Green Day, The All-American Rejects are a poor man's Simple Plan. It's fluffy punk pop for middle class American teenage girls who don't want to listen to Ciara and 50 Cent, and would rather get sweaty with boys in eyeliner than shake their booty to the latest Missy Elliott remix." "Dirty Little Secret" first charted in the United States on July 30, 2005 and became the band's first top 10 track on the Billboard Hot 100; peaking at #9 in January 2006. The song also climbed to the top spot of Billboard's Hot Digital Songs after a total of 26 weeks and later peaked at #48 on Billboard's "Year-End Hot 100 Singles of 2006". In the United Kingdom, "Dirty Little Secret" was originally released on October 24, 2005 but charted poorly at #96 on the UK Singles Chart. It was re-released in June 2006 following the success of the band's second single "Move Along" and gained The All-American Rejects their second top 20 hit in the UK. The video features anonymous people holding their secrets written on postcards. The music video for "Dirty Little Secret" was directed by Marcos Siega and shot in May 2005 in Dorney Park and various locations in Allentown, Pennsylvania and was released a month later in mid-June. It features a montage of various people holding up postcards sharing their "dirty little secrets" while the band perform the song in an abandoned warehouse with the cards enlarged and displayed behind them in a backdrop. The postcards in the video were posted by anonymous people onto the website PostSecret, a project where users can create their own cards; sharing their darkest secrets and posting them to the website without giving their name or any other details. The idea came from director Marcos Siega when searching for inspiration for the video. He performed an internet search of the word "secrets" and came across the PostSecret website. The All-American Rejects agreed with Siega's idea and paid the website to use some of their postcards for the video, with the money going towards The Kristin Brooks Hope Center, a non-profit organization which funds a suicide hotline. After the release of the music video, the band sold the postcards featured on eBay with the proceeds also going towards the Hope Center. ^ "FMQB Airplay Archive: Modern Rock". Friday Morning Quarterback Album Report, Incorporated. Archived from the original on March 22, 2013. Retrieved October 30, 2016. ^ "Dirty Little Secret by The All-American Rejects Songfacts". www.songfacts.com. ^ "All-American Rejects - Dirty Little Secrets Single Review". Contactmusic.com. Retrieved 7 June 2005. ^ "All-American Rejects - Dirty Little Secret". About.com. Retrieved 1 December 2005. ^ "The All-American Rejects - Dirty Little Secret". ClickMusic. Archived from the original on 15 March 2014. Retrieved 12 August 2005. ^ "All-American Rejects - Dirty Little Secret". Music OMH. Archived from the original on 13 December 2006. Retrieved 12 September 2005. ^ "Week Ending Dec. 28, 2008: America Goes On A Downloading Binge - Chart Watch". New.music.yahoo.com. December 31, 2008. Retrieved August 14, 2011. ^ "Hot Digital Songs: Dirty Little Secret". Billboard. Retrieved 2009-06-20. ^ "All-American Rejects Reveal Strangers' Secrets In 'Dirty' Clip". MTV. 2005-07-12. Retrieved 2010-06-11. ^ "ARIA Report (Issue #818)" ARIA Top 100 Singles. National Library of Australia. Retrieved March 8, 2018. ^ "Irish-charts.com – Discography The All-American Rejects". Irish Singles Chart. Retrieved March 8, 2018. ^ "Official Scottish Singles Sales Chart Top 100". Official Charts Company. Retrieved March 8, 2018. ^ "Official Singles Chart Top 100". Official Charts Company. Retrieved March 8, 2018. ^ "The All American Rejects Chart History (Hot 100)". Billboard. Retrieved March 8, 2018. ^ "The All American Rejects Chart History (Adult Pop Songs)". Billboard. Retrieved March 8, 2018. ^ "The All American Rejects Chart History (Pop Songs)". Billboard. Retrieved March 8, 2018. ^ "The All-American Rejects - Awards". AllMusic. Archived from the original on 2012-07-21. Retrieved March 7, 2018. ^ "ChartsPlus Year-End 2006" (PDF). Official Charts Company c/o UKChartsPlus. Retrieved March 8, 2018. ^ "Hot 100 Songs - Year-End 2006". Billboard. Retrieved March 8, 2018. ^ "British single certifications – The All-American Rejects – Dirty Little Secret". British Phonographic Industry. Select singles in the Format field. Select Silver in the Certification field. Type Dirty Little Secret in the "Search BPI Awards" field and then press Enter. ^ Grein, Paul (March 18, 2009). "Week Ending March 15, 2009: The Idol With The Most". Yahoo Music. Archived from the original on March 21, 2009. Retrieved February 6, 2016. 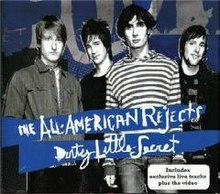 ^ "American single certifications – The All-American Rejects – Dirty Little Secret". Recording Industry Association of America. If necessary, click Advanced, then click Format, then select Single, then click SEARCH. Live from Oklahoma... The Too Bad for Hell DVD! This page was last edited on 28 December 2018, at 00:56 (UTC).